exam name, the date of examination, the application number, first name and last name and the birth-date. Passers of May & June 2016 Dentistry are advised that the Professional Regulation Commission has fully utilized the online registration for issuance of Professional Identification Card and Certificate of Registration in Manila. The date of registration will be provided in the main page together with the list of official results. Meanwhile, detailed step by step procedures on initial registration for board passers are itemized here. As posted, the date and venues of the ceremonies comes few weeks after the release of board exam. 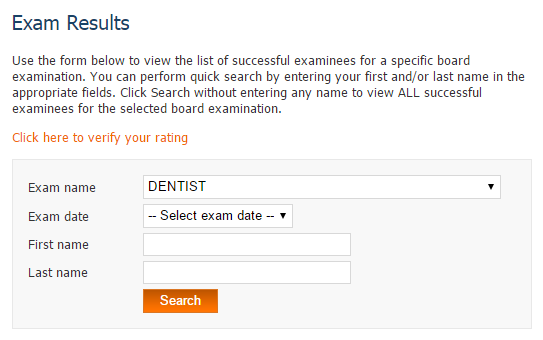 Meanwhile, we will keep you updated on related news and announcements about dentistry board exam via PRCboard.com's social media accounts (Facebook and Twitter). Yung rating po d po nagana. nakailang ulit na po ako mag open. hello ask ko lng po ... paano po yun kung a set no sa board exam nklimutan mong ishade.zero npu ba nun yun? (sana hindi nmn po.). mkikita ba at aayusin ba ng proctor ?mo yun..